How much does a typical 2,000 SF home in Windsor Heights (Atlanta) cost? Gold Button on Right. How much does a typical 2,000 SF home in Brookhaven (Atlanta) cost? Gold Button on Right. How much does a typical 2,000 SF home in City of Charlotte (Zip 28209) cost? Gold Button on Right. How much does a typical 2,000 SF home in East Hills (Philadelphia) cost? Gold Button on Right. How much does a typical 2,000 SF home in Kensington (Philadelphia) cost? Gold Button on Right. How much does a typical 2,000 SF home in McLean, VA (DC-area) cost? Gold Button on Right. How much does a typical 2,000 SF home in DC East (Zip 20018) cost? Gold Button on Right. How much does a typical 2,000 SF home in DC West (Zip 20016) cost? Gold Button on Right. Orlando, FL, June 18, 2015 --(PR.com)-- Homequant is pleased to announce the launch of 30-Second HomeValu – an automated home valuation system that, unlike Homequant, requires neither any upfront knowledge of the market nor the picking of a set of comps to contribute to the subject value. While users will be accessing the new 30-Second system off of the Homequant homepage, its presence has been made adequately conspicuous by a separate blinking gold button bearing the name. In order to value a subject in this system, all one needs to know is the Zip Code where the subject is located and its approximate building size. Of course, if the subject comprises of any of the four additional (“More” button) characteristics and/or upgrades – significant waterfront, in-ground pool, central air conditioning and recent renovation – the user will receive a more accurate value upon enablement (though the base value will be retained on the screen for comparison). 30-Second HomeValu is not only an excellent market knowledge tool for current and future homeowners, but is also great for loan officers, appraisers, assessors, analysts and brokers needing a “first look” valuation. It’s great for appraisal reviewers and hearing officers as a quick “visual review” tool. It’s ideal for homeowners to get a second opinion to challenge over-assessments. Unlike BPO, it’s backed by a sophisticated research base. Help is always right there next to the input fields. Hovering the cursor over the ‘?’ next to the input fields will provide the necessary guidance. Of course, everything is still in plain English, presented in an easy-to-understand format, without the usual appraisal jargon. And it’s all free and requires no registration or login whatsoever. People on-the-go will find HomeValu Mobile Apps – coming soon – extremely useful. Download links will be available on the Homequant site. Then, click on the Gold button at the top of the homepage and follow the prompt. Again, all you need is the Zip Code of the subject and its approximate building size. How Homeowners can relate to over and under assessment, spatially. Town Analyst Guides. Florida Home Markets - Where is the Biggest Housing BANG for the Buck, Statistically? Orlando, FL (Champ) vs. Las Vegas, NV (Challenger) - Who Wins in Housing? How Homeowners may know if their Town is Over-assessed. Town Analyst Explains. How Homeowners can relate to over and under assessment spatially. Town Analyst Guides. Homebuyers MUST Demand to See the Comps, Spatially. Homequant Illustrates! Homebuyers MUST Differentiate between Local Sales and Comps. Homequant Explains! Homebuyers MUST Choose Least Adjustment over Distance or Sales Recency. Homequant Enlightens! Three Sales from Three Prior Quarters – Unadjusted for Time - are NOT Comps. Homequant Describes! Homebuyers MUST Use Five Best Comps to Value a Subject. Homequant Demonstrates! Homebuyers MUST Verify Appraiser’s Values in Four Easy Steps. Homequant Reveals! Concept of "User-defined Subject" Helps Valuation Community. Homequant Establishes! 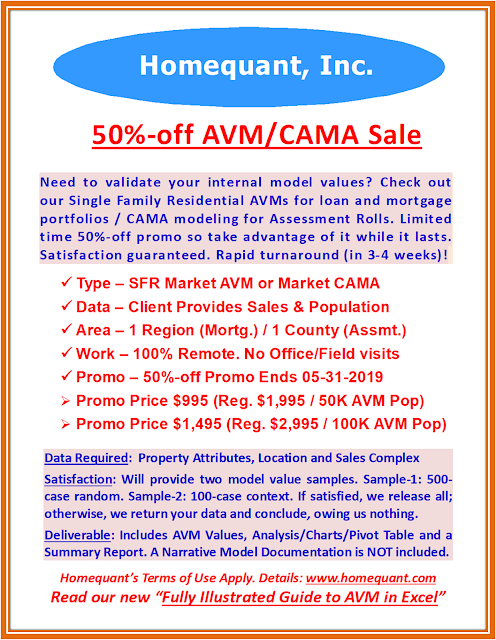 Automated Valuation Modeling (AVM) Helps Improve Portfolio / Assessment Performance. Homequant Proves! Try Meaningful Sales Metrics to Validate Low Value Drive-by and AVM-based Appraisals. Homequant Explains! To opt out, please return this email indicating "Remove." Thanks. Is Charlotte Housing Market More Affordable than Dallas, Minneapolis and Portland Markets? Answer - Yes. A median home in Charlotte is more affordable than its counterparts in Dallas, Minneapolis and Portland. Is Chicago Housing Market More Affordable than Dallas, San Diego and Washington DC Markets? Answer - Yes. A median home in Chicago is more affordable than its counterparts in Dallas, San Diego and Washington DC. Is Washington DC Housing Market More Affordable than Dallas, Ft Lauderdale and Salt Lake City Markets? Answer - No. Washington DC market is significantly pricier than its counterparts in Dallas, Fort Lauderdale and Salt Lake City. Is Los Angeles Housing Market More Affordable than Brooklyn (NYC), Chicago and Philadelphia Markets? Answer - No. A median home in Los Angeles is more expensive than its counterparts in Brooklyn (NYC), Chicago and Philadelphia. Is Orlando Housing Market More Affordable than Phoenix, Portland and Queens (NYC) Markets? Is Miami Housing Market More Affordable than Houston, Las Vegas and Seattle Markets? Answer - While a median home in Miami is more expensive than its counterparts in Las Vegas and Houston, it is however more affordable than Seattle's. Is Seattle Housing Market More Affordable than Atlanta, Denver and Long Island Markets? Answer - No. A median home in Seattle is less affordable than its counterparts in Atlanta, Denver and Long Island, NY. Is Minneapolis Housing Market More Affordable than Tampa, Denver and Staten Island Markets? Is Cleveland Housing Market More Affordable than Atlanta, Boston and Denver Markets?